You have no doubt been wondering why we have traveled half way round the world to stay in a place like Sandakan,. The first is that it is a forty five minute drive from Sandakan to the tiny hamlet of Sepilok. 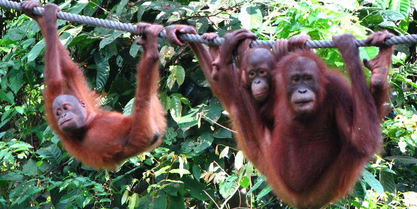 Sepilok is the proud home of one of only four orangutan rehabilitation centres in the world. So we set off for Sepilok. The forty five minute drive takes two hours, partly due to a certain person who will remain nameless giving the driver (that would be me) the wrong directions, and partly because most of the road is being dug up and resurfaced. 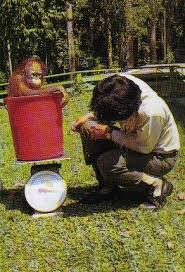 The orangutan rehabilitation centre was set up 50 years ago and has had great success in rescuing orphaned and injured orangutans, rehabilitating them and returning them to the wild . 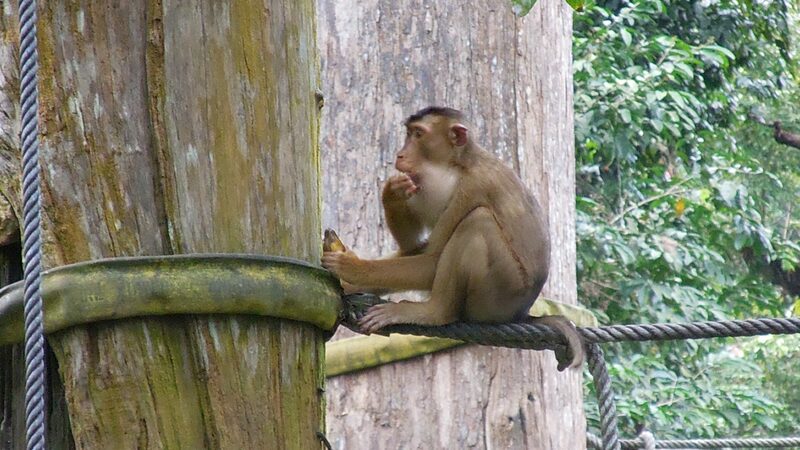 The good people of Borneo also like to take babies from the wild and keep them as pets. 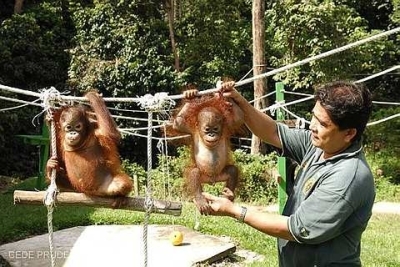 It has been illegal for some time to keep an orangutan as a pet, and there are stiff penalties. These poor creatures are kept in tiny cages and when they are found they too are taken to the rehabilation centre. An orangutan mother does not willingly let her baby go. The good people of Borneo have discovered that the easiest way around that problem is to kill the mother. The people who enjoy killing the mothers and keeping the babies as a pet are often the very wealthy for whom it is one more sign of their power and virility. Sadly that same power usually allows them to be above the law, and they usually avoid prosecution. Perhaps a rehabilitation for them is the answer. The centre now covers an amazing 40 square kilometres and there are boardwalks through some of this area for the public to walk and hopefully catch sight of these gentle creatures. We could watch for hours, but it is feeding time for the adults and as this is the one time we are most likely to see the orangutans in their habitat we head off along the boardwalk to the feeding platform. Twice a day the wardens take large quantities of fruit to the platform, partly for the orangutans benefit, but partly for the tourists. 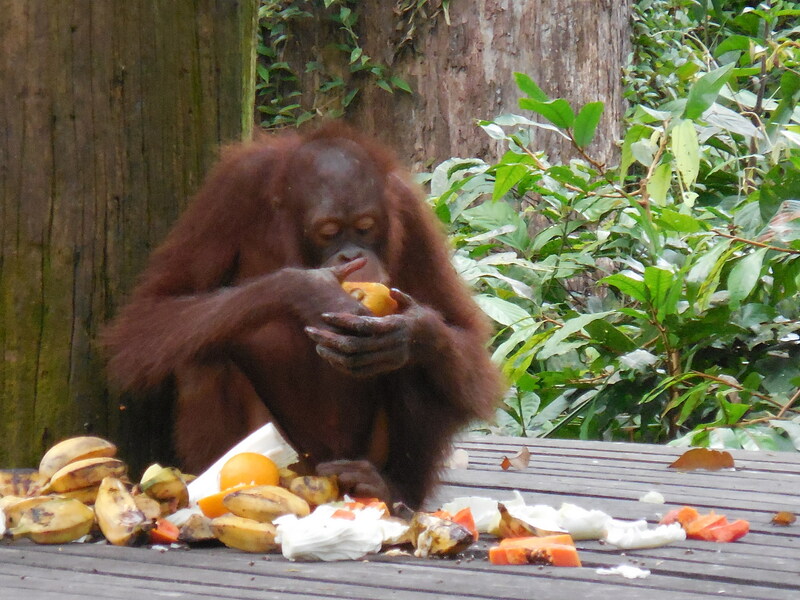 To clarify, the tourists don’t get to eat the fruit but they do get to watch the orangutans feeding. If the orangutans have had a successful day finding fruit on their own they won’t come, but if they are hungry they know to come to the platform. The entertainment carries on for some time. But the after dinner show is the highlight. It is a little risque (well a lot actually) and not the normal sort of show put on for tourists, unless that is, the tourists are Australian or Russian and visiting Phuket. The show starts with a female macaque monkey walking rather seductively along the railing of the walkway, towards the audience, strutting her stuff in a very coquettish way. Even the most innocent observer could see that she is clearly in heat. She advertises the fact by raising her extremely large and very red behind in the air. and within seconds it is all over. He immediately pushes her away and if he could smoke a cigarette he would. Like all males, he looks immensely proud of his performance. He struts off without giving her another look. He doesn’t even take a moment to wonder if it was as good for her as it was for him. I would say it was extremely doubtful. She walks off totally unruffled and somewhat disappointed. 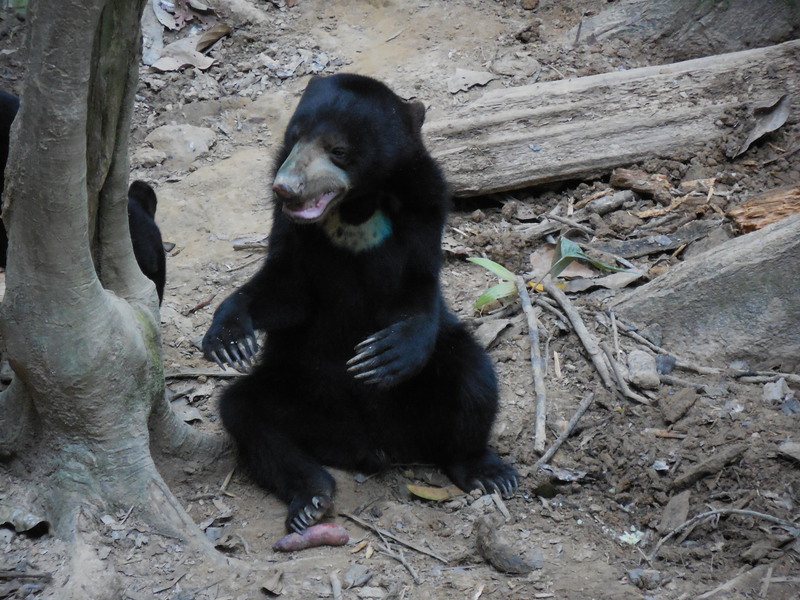 The orangutan sanctuary has been a great success and has encouraged the wild life experts to set up a similar rehabilitation center for the sun bears, the smallest of all the bears, that reside only in southeast Asia. Their numbers are dwindling rapidly as their rainforest habitat shrinks. These bears too have been kept as pets and it is proving a long and tricky job to rehabilitate them. They have not released any of the bears as yet, but are hoping to release the first few in May. It has been a long and rewarding day, and what we really feel in need of is a nice cup of tea. Surprisingly Sandakan can arrange that. 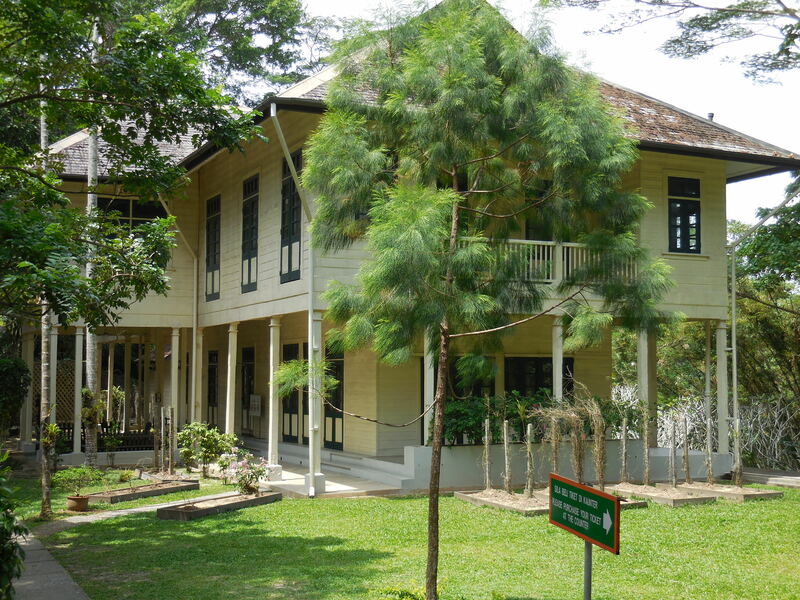 On top of the hill overlooking the town is a wonderful house that belonged to Agnes Keith an American author famous for her books on life in Borneo. She spent 5 idyllic years in the house with her English husband in the late 1930’s. Then like the rest of the town, it was totally destroyed during the war. After the war Agnes and her husband returned to rebuild the house. It is now open as a small and fascinating museum. Also on the grounds is the English Tea House & Restaurant, conveniently ignoring Keith’s American background and the fact that she found Sandakan to be ‘too British’ when she first arrived. We sit pleasantly for a while under the shade of the spreading trees, sipping tea and gazing out over the bay. This entry was posted in Malaysia and tagged Borneo, Orangutan. Bookmark the permalink. We really have t plan a trip together. Orangutans have such melancholy faces. Just saying. My husband was surprised that there were no tales of woe in the orang utang episode. Although the foreplay sounded woeful to me. Nothing like a nice cup of tea after a **x show. My, what fabulous big claws those bears have – you must be quite envious? 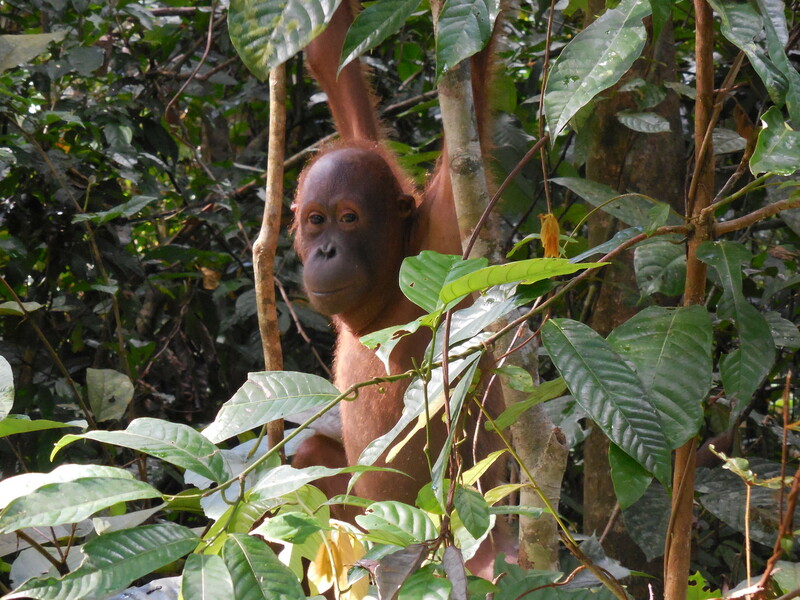 Thanks for the great info & photos re orangutangs. Regarding the second sentence in this post, what was the other reason ?